Blogging is a conversation. It's all about people publishing their ideas, and other people interacting with those ideas. But what happens when no one reads what you're publishing? Well... nothing. Nothing happens. You continue to project your ideas, and you have a one-sided conversation with the air. No one wants that. But so many of us are just broadcasting our blog feeds out into the internet, hoping that people will find them. How do we find people who want to read and interact with our ideas? One good way is to join some blogging communities. Free publicity. On most blogging communities, your content can be featured on your own profile and on your connections' dashboards, allowing people to see your stuff as you publish it. Some blogging communities will even feature good content on their home pages, allowing even people you haven't met yet to find your blog. Free organic traffic. Some blogging communities have databases in which all their members' blogs are organized by type or by category. This is very useful for people who are looking for blogs with specific content within a specific community. Who wouldn't want to cash in on that potential traffic? Ease of subscription. Not everyone chooses to follow blogs in the same way. Some choose to follow through their blogging community's feed reader. By having your blog registered on your readers' blogging communities of choice, you make it easier for more people to follow you. The last thing anyone wants is to lose a subscriber simply because they didn't have a blogging profile on the right community. Statistical probability. The more links to your blog that exist on the internet, the higher the likelihood that someone will click on one of them. It's a lame reason, but it's a reason. Blogging is a conversation, and conversations happen most easily when we have a relationship with someone. There really are people out there who want to read your content; you just need to find them, and you need to befriend them. Blogging communities can help with that. Blogging communities allow us to easily connect with people we've never met before. It takes a lot of diligence and patience to begin and maintain relationships through these communities, but in the end it's worth it. You won't become fast friends with everyone you meet on a blogging community, and that's perfectly okay. But I think you'll be surprised to find that there are some quality people out there who are looking for the same thing you are: a supportive friendship and a loyal reader. Some of the people with whom I converse the most are bloggers - people I've never met in person, but with whom I have strong relationships. Participating and contributing to a blogging community can be a very rewarding experience. If people there see that you are a quality person, they will notice you, befriend you, and recognize you for it. Last week, for instance, I received my very first blogging award from the Authentic Blogger community because I participate in the community's discussions and because I publish quality content there. Since receiving that award, the number of daily page views on Heart, Soul, and Mind has doubled! This is just one example of how blogging communities can help you find both friends and readers. These are some communities that I have joined, in order of personal preference, and I think you might like them too. Please feel free to send me a friend request on any of them. 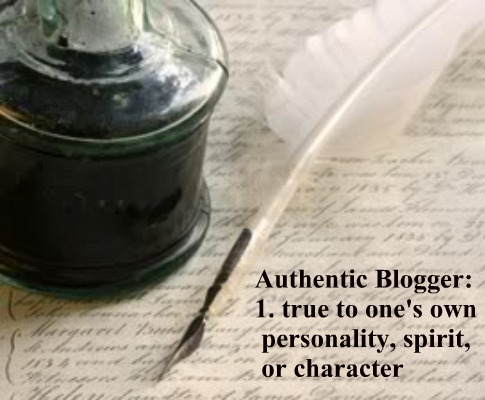 Authentic Blogger Note: From time to time, we (Marty & Dawn) may invite a fellow blogger to contribute blog articles that we feel suit the personality of our format. Jenn Boyer's Learning How post is a wonderful blog to give helpful tips on the community aspect of the blogging world. Thanks for re-posting this, Marty! It's very flattering that you find my content good enough for AB. One thing I want to note to anyone interested in finding my content on Facebook is that my primary blog (Heart, Soul, and Mind) has a Fan Page there as well. This one of the points mentioned in a post [http://blog.socialmaximizer.com/11-simple-tips-that-guarantee-more-comments-for-your-blogs/] about getting more comments from the readers. More readers don't always mean more comments, but I guess this is one tip that can give you both. Jenn, we were happy to post your blog here - it has very useful suggestions and info for people who are new to blogging, or who may not have figured out how to grow their readership. Thanks for allowing us to re-post!